My view from the plane entering New York City. No matter how many times I visit New York City, I still get just as excited as if I’m flying in for the first time! The view of Downtown Manhattan is one of my favorites. Did you know the city is home to over 8.6 million people? It’s a far cry from my home of Marsing, Idaho, home to a little over a 1,000! Luna, a 3-year-old Silver Fox from Wildlife Rockstars. So if I fly to NYC by plane…How do the animals get there? That’s the number one question I get asked when I appear on The Today Show! The answer is simple. I collaborate with local wildlife rehabilitation facilities, outreach programs, zoos, and aquariums who have animal ambassadors. The animals I work with are comfortable around people and are used in educational programs. Phyllis Quiller, a North American Porcupine. This time around I worked with an organization called Wildlife Rockstars. It truly is a one-of-a-kind program where they use animals to help people who have suffered from traumatic brain injuries. 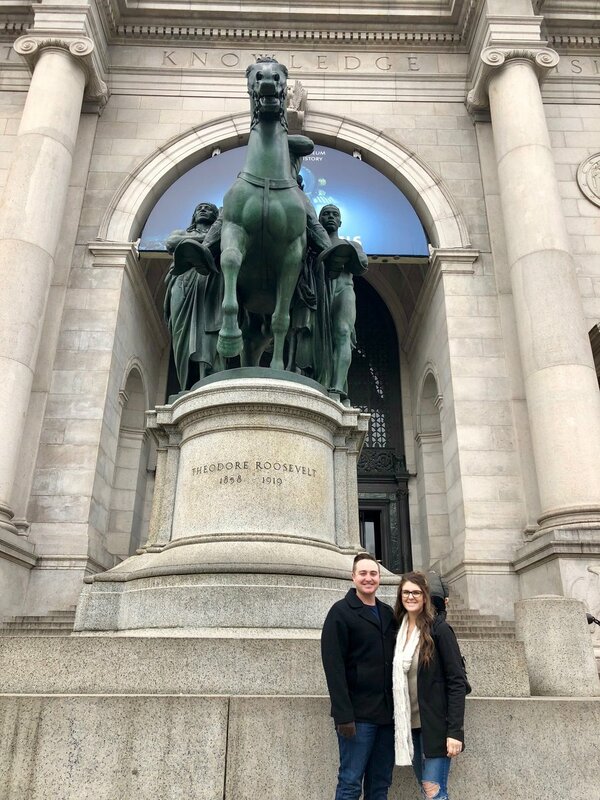 My wife and I in front of the American Museum of Natural History. We flew in a day early and had one thing on our minds: Visiting the Museum of Natural History! At 2,000,000 square feet, it is one of the largest museums in the world! You could literally spend days, even weeks inside this place! Being obsessed with Africa, you can guess one of my favorite areas of the museum was the Africa wing. Sadly, it was a somber feeling knowing that all these animals were once alive; many of them collected in the late 1800’s. On the bright side, many of the specimens collected were used for research and now educate the 5 million visitors that walk through the museum’s doors each year. Asiatic Lions differ from African Lions by being slightly smaller and having shorter manes. They also have a longitudinal fold of skin that run along its belly, absent in African Lions. One of the animal displays that sparked my interest the most was in the Asian animal wing. At first glance, these might look like ordinary African Lions, but in fact they are not. These are Asiatic Lions. They used to roam throughout the Middle East and parts of Asia, but are now restricted to a tiny reserve in India. This is due to habitat loss and hunting. Sadly, there are only a few hundred left today. The most famous resident at the Museum of Natural history, the Tyrannosaurus Rex. Walking into the dinosaur wing was like re-living a childhood dream! I was absolutely obsessed with dinosaurs as a kid so seeing a real Tyrannosaurus Rex skeleton was definitely surreal. Did you know that the skull pictured above is a replica because the actual skull is too heavy to display? The actual skull is located at the base of the exhibit. It was the first of its kind and was displayed over 100 years ago. The day of the show, we meet early outside of the VIP entrance and take the animals down to a private area outside of the green room. During this time, I meet the handlers, go over on-air animal transitions, and most importantly, meet the animals! Walking into the famous Studio 1A. Check out those lights! After we receive the go-ahead from the producers, we take the animals to the studio to get ready for the live segment. To get people around the country excited about the upcoming segment, we film a tease with one of the animals. Of course, Ozzy the Eurasian Eagle-owl was the perfect choice. Photo courtesy of Nathan Congleton, Today Show Photographer. AND IT’S SHOW TIME!!! When the show is live, my concentration is on the animals, the hosts, and getting information out as fast as I can. Everything else in the background becomes a blur. One of my favorite parts about having this national platform is being able to to showcase animals that are often misunderstood. Foxes, like Luna above, are trapped, poisoned, and feared all across the nation. In reality, foxes are EXCELLENT for rodent control! Did you know porcupines are covered in over 30,000 quills? Or that each one is equipped with barbs that expand once it hits the skin? Luckily, Phyllis Quiller is used to people and was content munching on her granola bar! And just like that, the segment is over! Time for a quick picture with the hosts Jenna and Hoda, and everyone prepares to head out. The amazing team at Wildlife Rockstars behind-the-scenes on set after the segment.